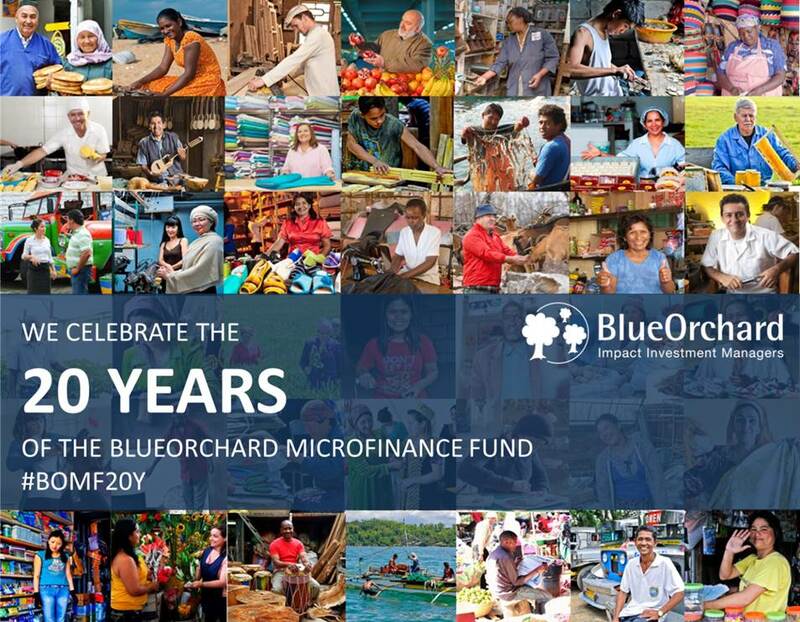 Zurich, 18 September 2018 – BlueOrchard Finance Ltd (“BlueOrchard”), a leading Swiss-based impact investment manager, is proud to announce the 20th anniversary of its flagship fund, the BlueOrchard Microfinance Fund – the largest commercial microfinance fund in the world. To further raise awareness for investment needs in developing countries, BlueOrchard has initiated the Impact Summit, taking place in Switzerland this October. The BlueOrchard Microfinance Fund (BOMF) has become with more than USD 1.7 billion AuM the largest commercial microfinance fund in the world and has achieved competitive returns for its private and global investor base, including banks, insurances, and pension funds. For 20 years, BOMF has been fostering inclusive growth in 69 emerging and frontier markets, providing access to financial and related services to over 20 million low-income individuals and households by investing in 325 microfinance institutions. Today, 53% of the Fund’s clients are women entrepreneurs and 42% live in rural areas. BOMF addresses with its investments 11 out of the 17 United Nations Sustainable Development Goals (SDGs). “During the last 20 years BOMF has proven that financial returns and social impact go hand in hand. While it has grown to become the largest commercial microfinance fund in the world, it remains under the same mission and vision, committed to fighting poverty and empowering people in emerging countries. We are proud to celebrate today the 20th anniversary of this unique fund, said Peter A. Fanconi, BlueOrchard’s Chairman of the Board. “We are thankful to our investors for making this milestone anniversary possible. Investors today are increasingly asking for investment solutions that generate a financial return while making a social and/or environmental impact. We will continue to provide our investors worldwide with attractive investment solutions which contribute to solving the social and environmental challenges of our time,” said Patrick Scheurle, CEO of BlueOrchard. In 1998, the General Assembly of the United Nations designated 2005 as the International Year of Microcredit. The Year was established to promote the contributions of microfinance to creating an inclusive and sustainable financial system, which grants access to financial services to the world’s poor. Under the umbrella of the Year, several initiatives were instigated by the UN to encourage microfinance investments. One of these was the launch of the world’s first fully private and commercial microfinance fund in 1998, the BlueOrchard Microfinance Fund (BOMF). The aim was to furnish proof to the idea that fighting poverty and generating market-rate returns is not an either-or choice. Today, 20 years later, reducing poverty and inequalities are as important and efforts to tackle these challenges are even impeded by the consequences of climate change. Taking place on the 3rd and 4th of October in Pontresina, Switzerland, the BlueOrchard Impact Summit will therefore focus on how investments in Inclusive Growth, Climate Change, Education and Sustainable Infrastructure can be mobilized at scale to address these challenges in developing countries and to close the alarming annual investment gap of USD 2.5 trillion in key sustainable development sectors. “The upcoming BlueOrchard Impact Summit is a fantastic opportunity for leaders from around the world to discuss resources required to achieve the SDGs in the years to come”, said Peter A. Fanconi, BlueOrchard’s Chairman of the Board. The Summit will bring together thought leaders from around the world, from public and private sectors to discuss, exchange, learn from each other’s experience and consequently derive solutions on how to reduce today’s rising inequalities. For more information on the Summit and the speakers, please visit: www.blueorchard-summit.com.